As protests against the coup government in Honduras enter their 60th day, the international community has largely turned their attention away from the streets of Tegucigalpa. This lack of awareness, combined with heightened state repression, has done little to deter the ongoing disobedience campaign inside Honduras. In the meantime the Obama administration says virtually nothing, in their silence giving a green light to the military coup to keep on repressing the pro-democracy movement. The rest of Latin America sees this US hypocrisy -- Obama and Hillary talk about change and hope but in the end we witness the same old US policy of supporting the right-wing oligarchs in the region. This Air Force recruiting advertisement shows Unmanned Aerial Vehicles (UAV's) and their connection to military satellites......these war-fighting satellites have to now be viewed as actual weapons in space as they direct warfare on the ground. These UAV's, or drones as they are popularly called, are the theme of our Keep Space for Peace Week in 2009. They are the key link between Iraq and Afghanistan wars and understanding how space technology coordinates all modern warfare. Be sure to let us know what your plans will be. I am just now beginning to compile the international list of local events. Each year we usually see over 100 actions happen in a dozen countries. 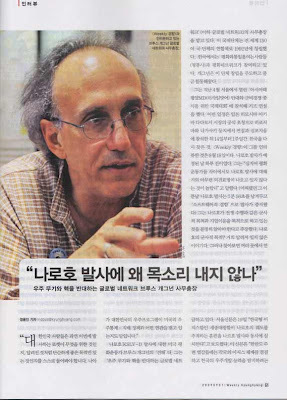 This appeared in the Weekly Kyunghyang newspaper in South Korea. Sung-Hee Choi writes from Korea that, "Your interview in the Weekly Kyunghyang was selected by the popular website here. It is the site which most Koreans see it as the home Internet site. The letters underneath your photo says, 'Today’s Figure, Secretary, Bruce Gagnon Why Don’t Make the Voice Against the Rocket Naro?' How do you think? I should definitely try to translate the article. THANK YOU, YOU DID IT!!!!!!!!!!" The rocket Naro is the name of South Korea's ill-fated first rocket launch that went awry a couple days ago. It appears I am one of the first to publicly speak out against the launch. Can't wait to see what the article said. We spent more than two-hours talking to the reporter. What Sung-Hee gets wrong is that I didn't do it. She did it. She was the one that made it all happen. I have been dragging the last couple of days. When I travel on these trips only my strong will keeps me going when I get worn out. Once I get home, and allow myself to slow down, it takes 1-2 days for my body to accept the fact that it can now take a break. Once that happens the energy flows out of me like air out of a balloon. Last night I forced myself to join Peter Woodruff for our weekly radio show in Brunswick that airs on a local college station. The two-hours of playing good music and talking politics always helps refresh me and I'd missed the last 5 shows and didn't want to miss another. It's always great fun to be with Peter. Today I will mow the grass with our old-fashioned push mower and work outside some in the yard. After weeks of global warming summer here in Maine, today is sunny and cool, just like Maine summers are supposed to be. Senator Russ Feingold from Wisconsin is one of the more thoughtful members of the US Senate. He thought about running for president last time around but bowed out. I think he is a decent man. Here he talks a bit about the need to get out of Afghanistan ASAP. Deeper analysis on US Afghanistan plans from The Real News. South Korea's first home-grown rocket and satellite launch was a failure today. The $400 million rocket delivered its satellite payload far above its intended orbit. 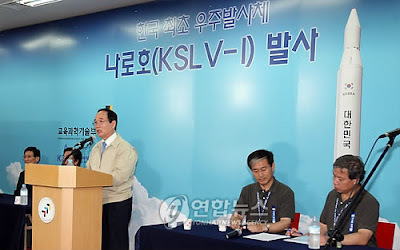 The cost of the satellite is not being mentioned in South Korean media, likely because they don't want the taxpaying citizens to be aware of the massive amounts of public funds lost on the failed mission. "Since the 100kg scientific satellite does not have any on-board propulsion systems, if it fails to enter proper orbit there is no way to correct its trajectory," one expert said. He declined to say whether the satellite was lost or if it went into orbit, but cannot be found. 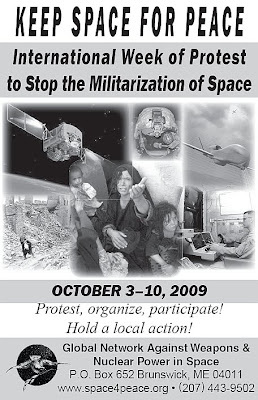 Not enough people in the South Korean peace movements are yet knowledgeable about space issues to the point where they were actively tracking this mission. After my recent trip there, and this failed launch, I would imagine that will begin to change. One of the interesting things about this South Korean rocket launch is the hypocrisy connected to it. When North Korea recently launched a rocket and attempted to put a satellite in orbit both the US and South Korean governments went ballistic - pardon the pun. But when the shoe was on the other foot, no problem at all is proclaimed. This double standard is the reason that so many people around the world have such little respect for the US and its allies these days. My mother always used to say, "What's good for the goose, is good for the gander." On August 23 the US test-fired another Minuteman nuclear missile from Vandenberg AFB in California into Kwajalein Atoll in the Pacific Ocean. Then South Korea launches its first rocket. In both cases these two "good guy" countries are doing the same thing they scream at North Korea for trying to do. You can't have it both ways. Why is testing nuclear rockets and putting satellites in orbit wrong for one country but OK for another? I guess the answer is: which side of corporate capitalism are you on? 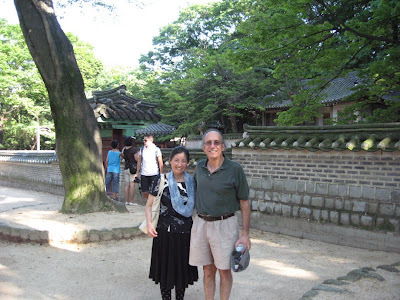 Here is a photo of Sung-Hee Choi taking me to a palace in Seoul. She would not let me post photos of her while I was there, not wanting any attention given to her outstanding, yet humble, efforts to coordinate my trip to her country. Now that I am home she can't scold me. She lives two hours from Seoul and took a train back and forth home each day during my trip. She made extraordinary efforts on behalf of the Global Network. Made it home about 10:00 pm last night. Got up at 4:00 am this morning, wide awake, so began sorting through all my mail and messages. By 8:00 am I'd run out of gas and feel like I am ready to go back to bed. Legs feel very heavy right now. Had a suitcase full of gifts to give to housemates and others. This Sunday we have our Addams-Melman House monthly potluck supper (5-7 pm if you are in the neighborhood) where I will layout on the table a bunch of the gifts I was given in Japan and South Korea and will talk about the trip. Just going to do the bare essentials during the next couple of days. I am told we have an Afghanistan war veteran staying with us the next couple of nights. 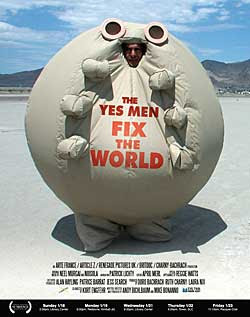 I'd love to get him in the studio for an interview on my public access TV show if we can schedule the studio time. Our garden has grown enormously in the month that I've been gone. So much to get caught up with.